Published Aug 27, 2014 by Peachpit Press. Part of the Learn by Video series. 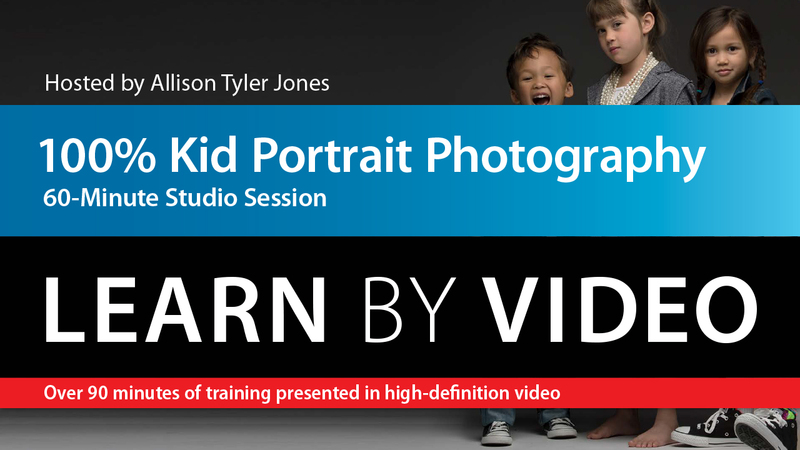 Pro photographer Allison Tyler Jones provides inspiration and practical techniques for photographers to authentically capture kids during a typical 60-minute studio session. In video, Allison approaches studio lighting specifically for kids with a mix of technical information and easy-to-follow steps for both the preparation and working with subjects who are shy, naughty, showing off, or constantly in motion. Allison’s style is spontaneous and natural. And the expressions she captures are knowing and timeless. Her unique teaching style of breaking down complicated lightening scenarios, providing simple styling and direction techniques, and placing the child and their personality at the center of the shot is a winning combination. • Using the Five Ms of lighting–mood, main, measure, modify, and move–and how to include them in your decision-making process. • Lighting and using a white seamless background for modern looking kid portraits. • Choosing props with meaning, clothing suggestions, and styling techniques for the shoot. • Posing tricks that work with the most stubborn children. • Directing the shoot for 100% real expressions and tactics for managing kids, parents, and even pets. • Moving beyond trends to develop your unique point of view and photographic style. This 90 minute video is wrapped in a unique interface that allows you to jump to any topic and also bookmark individual sections for later review. The popular “Watch and Work” mode shrinks the video into a small window to allow you to work alongside the instructors.